Gillian Brightmore is a fiction and script writer born in Wales and an activist in mental health issues. She has published a number of short stories, most successfully, ‘The Woman who loved Cucumbers’ (Honno Short Fiction – 2002). Her work has appeared in Planet Magazine, Big Issue Cymru, Everywoman Magazine, Roundyhouse, Poetry Online Express, ‘Exchanges: Women Writing in Wales’ (Honno Poetry – 1990) and Velvet Magazine. 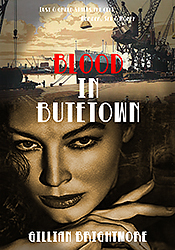 The perpetrator of a series of crimes against women taking place in the city, Wesley Travis, is hunted down in the shabby streets of a rundown dockland area by a no-nonsense woman police officer, D.S. Raz Raison. However this is not only a story of murder, but also a love story. Laura Ridgeway, an accidental bystander at the second murder scene, becomes caught up in the case, becoming embroiled in a dangerous underworld of double-dealing and subterfuge when she embarks on an affair with Raz Raison. Unwittingly she has also become the object of Travis, her work colleague’s, misplaced affections. His unrequited passion spurs him on to further hideous crimes so that Laura is trapped between the kisses of an unreliable lover as well as the uncalled for embrace of the killer himself. How will Laura survive in a world alien to her where everyday assumptions no longer hold sway?